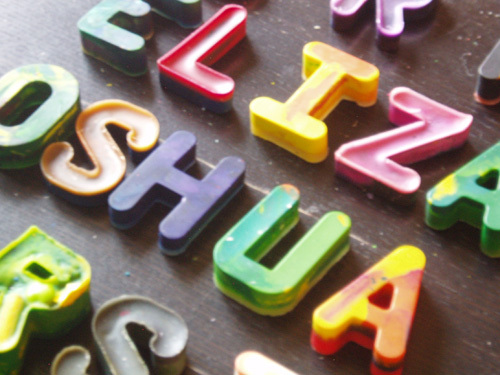 For this year’s birthday project, the kiddos and I have made crayon letters that spell out each of their cousin’s names. We had plenty of old broken crayons and have had a great time deciding which colors to combine to create a personal set for each. Special thx to Grandma and the dancer for helping me unwrap so many old crayons (truly the longest part of the prep work). Other than that, the longest part was waiting for the crayons to harden so they could be carefully peeled out of the mold. Remove paper from old crayons. Fill silicone alphabet molds with small pieces of broken crayons. (I learned that the very thick crayons need to cook longer, so best to use the regular size for even melting…pictured below, the thick yellow in the “D” didn’t all melt). Carefully pop out each letter. (the “S”, “M” and “N” seemed to be the most difficult letters to remove without breaking them…loosen up the letters by pulling at mold in all directions before trying to remove them. Meanwhile, the new crayons are wrapped along with a few small chocolate treats and accompanied by a coloring or sketchbook…hope they enjoy them as much as we’ve enjoyed making them! Where did you find the great alphabet molds? I love this idea. Thanks for sharing! What an amazing idea! I love it. 🙂 I’m hoping our crayons will last longer from now on. Even the little ones have a hard time writing with the smallest of stubs!